You should really take the time to get to know your ukulele, otherwise when you hear someone mention the nut or the saddle you’re not going to have a clue what they’re talking about and you might end up looking the fool. 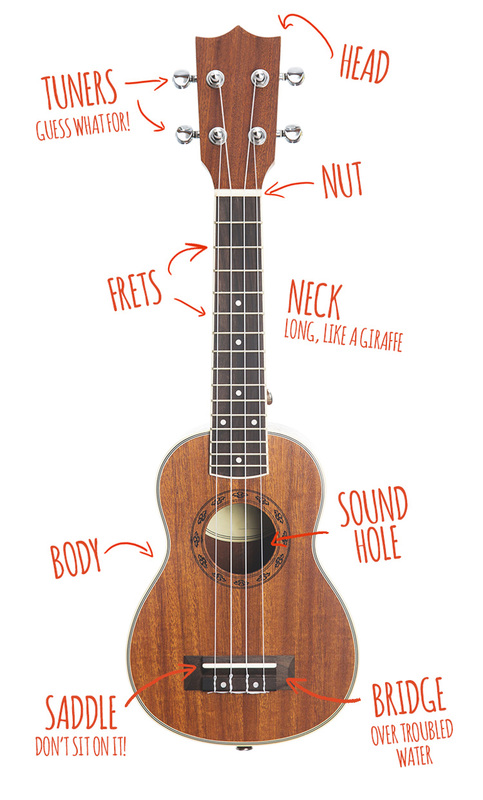 So you’ve bought a good quality ukulele (hopefully you bought one of my recommended ukuleles) – now you need to know which bit is which. The head of the ukulele holds the tuning pegs and makes a great place to leave your clip on tuner attached to. The tuning pegs are for helping to get your ukulele in tune. Usually when your ukulele is quite new, you’ll find that you need to tune up each time you pick up to play but once your strings are stretched out you shouldn’t need to do this quite so much. Tuning pegs mainly come in 2 varieties, geared tuners (usually found on laminate ukuleles) and friction tuners which are often found on more expensive ukuleles. This is a very general rule of thumb though. This is the place where your fingers will spend most of their time. The frets run across the neck getting closer together the further up the neck (towards the body) they are. Ukulele bodies come in different shapes. The most common shape is the double bout (seen on the diagram above) but there are plenty of others on the market – there’s even a few flying Vs! Generally, the larger the body, the louder the ukulele. Together the bridge and saddle have the job of passing the vibrations from the strings to the top of the ukulele in order to get it to make an audible sound.